In March 1864, boyhood friends John Regan and Patrick Foley from Macroom, County Cork, arrived in New York port on the City of Baltimore sailing from Cobh. They took to life in America quickly and in 1870 both were married. John Regan married Mary Quinn and they had four sons and two daughters: Cornelius (Neil) , Ellen, John, Patrick, Jeremiah (Jerry), and Mary. Patrick Foley married Mary Crowley and the couple had four children: Margaret, Timothy, Mary, and John. After 15 years at work in the mills and machine shops of Fisherville, New Hampshire both families seized the opportunity to move west, own their own land, and raise their families in an Irish Catholic community. 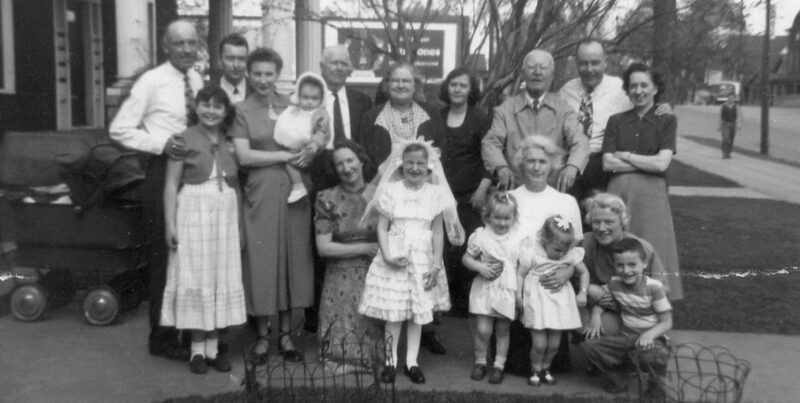 By 1880, the Regan and Foley families were established in Tara Township near Clontarf, Minnesota – active in township government, members of St. Malachy Catholic Church, and proud farmers on land they owned. This photograph of the sons of John Regan and Patrick Foley – four first generation Americans – captures one of those moments in American history when anything seemed possible. It is the turn of the twentieth century and Neil, Jack, and Jerry Regan and John Foley look poised to take on what the world had to offer. Their confidence is palpable and represents the optimism shared by many Americans at the time. Over the years, confidence waned as youth faded and the realities of life took hold. This included falling crop prices, farm failures, personal hardships, and economic depression, but on the day this photograph was taken, with cigars pursed in their lips and hats perched jauntily on their heads, these four young men look as if the world is their oyster. The Regans and the Foleys came together again in the next generation – Mary Foley was my grandmother’s mother and Cornelius (Neil) Regan was my grandfather’s father. Since the photo was published, I have learned that Patrick Foley and John Regan came from Kilmichael Parish in West Cork. Categories: Where they went | Tags: America, Clontarf, Concord New Hampshire, emigrants, Foley, Ireland, Regan | Permalink.